If Logan Melin could talk, she’d have a lot to say about her six years on Earth. She might start with her life- long battle with autism. Then, the tragic death of her older sister. Then maybe, just like any other kid, she’d tell you her favorite place to play. But at least for now, you can’t hear Logan saying any of those things. Or anything at all. Logan, like many children on the autism spectrum, is completely nonverbal. Her family moved to Lafayette from Monticello in 2011 to provide Logan with therapy. Now, a fundraiser they are organizing for her treatment center is quickly establishing them as the face of autism awareness in Greater Lafayette. But it’s only one chapter in a story about their journey with autism spectrum disorder — a story shaped by tragedy, uncertainty and hope. Before Logan, there was Lauren. Lauren’s autism diagnosis came as a shock to Teresa and Rob Melin, who became parents in 2002. At 2, Lauren was seeing a speech therapist through First Steps, a state-run program that helps infants who are missing developmental markers. When the therapist said she thought Lauren might be autistic, Teresa was confused. But soon, they discovered all Lauren’s quirks were actually symptoms associated with the autism spectrum. She was extremely prone to sensory overload. She couldn’t stand anything tall, such as basketball hoops. She loved to climb on dangerous objects. She hated wearing clothes. After days of research, Teresa started finding help for Lauren. The Melins even tried alternative therapies, costing upward of $2,000 and bringing no improvement in their daughter’s behaviors. When Logan was born in 2007, it didn’t take long to realize that she too was on the spec- trum. Although autism in siblings is common, girls are four to five times less likely to be on the spectrum than boys. Logan’s condition was diagnosed as more extreme than Lauren’s. When Lauren reached kindergarten age in 2008, no school in Monticello could provide for her needs. Twin Lakes School Corp. officials told the Melins that their only option was to send Lauren by bus to Fairview Elementary School in Logansport, which had classrooms that accommodated children with special needs. Just a month into the school year, on Sept. 27, 2008, Lauren was killed in a crash on her way home from school. A dump truck, swerving to avoid a motor scooter, clipped the rear of Lauren’s school bus, knocking it on its side in the middle of a traffic lane. A second dump truck crashed into the roof of the bus, sending it into a ditch. The sole survivor on the bus was the driver. Lauren and the three other special-needs children on board were killed on impact. When Teresa and Rob arrived on the scene, police did not let them close enough to see the bus or the victims. Unfortunately, they didn’t need to know. Teresa and Rob Melin know they will never get over the loss of their 5-year-old daughter. But how could they fall apart, with another young autistic child to care for? So eventually, grief turned into passion, and passion turned into work. Teresa threw herself into caring for Logan and a third daughter, Blake, who does not have autism. Rob started working extra shifts as an electrician to pay for Logan’s therapy. They donated all the money given to them after Lauren’s death to her preschool in Monticello and the kindergarten in Logansport to improve services for disabled children. Then they organized a fundraiser that raised $5,000 for the Indiana Resource Center for Autism. When it came time for Logan to attend kindergarten, sending her to Logansport was not even considered. “I will never, ever put my child on a bus again,” Teresa said. The couple decided to leave Monticello, where they had lived most of their lives. 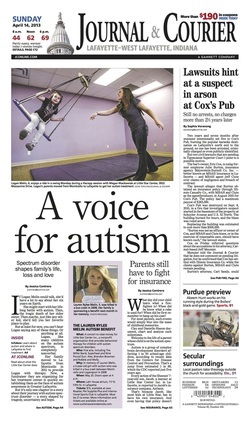 They bought a house in Lafayette and an additional insurance plan to cover intensive treatment for Logan at Little Star Center Inc., a nonprofit autism treatment center that provides Applied Behavior Analysis therapy. The idea behind the system is to motivate children to learn, communicate and reduce unwanted behaviors through positive reinforcement. The Centers for Disease Control and Prevention calls ABA a “notable treatment” that’s become widely accepted among health care professionals. Within weeks, the Melins saw improvement in Logan’s behavior. When she makes steps in learning new skills, Logan is re- warded with favorite toys, including a trampoline and a swing. Her blue eyes often are fixed to the pages of a magazine — not to read but to watch her hands play with the pages. Therapists also are helping Logan learn not to take off or chew on her clothes. Teresa and Rob also are learning what it’s like to have a child without autism. Blake now is 3 years old. And in a way, their attention to their first child hasn’t wavered. They continue to memorialize Lauren by trying to give other kids with autism the kind of help she never had. The proceeds from the second benefit event in her memory, which will take place in Lafayette on May 25, will be donated to Little Star Center. Read this story at jconline.com here.